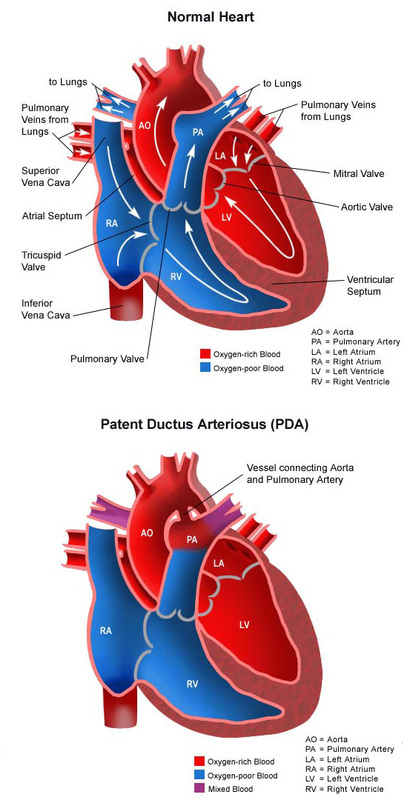 Patent ductus arteriosus (PDA) is a heart problem that is usually noted in the first few weeks or months after birth. It is characterized by the persistence of a normal fetal connection between the aorta and the pulmonary artery. All babies are born with this connection between the aorta and the pulmonary artery. While your baby was developing in the uterus, it was not necessary for large amounts of blood to circulate through the lungs because oxygen was provided through the placenta. During pregnancy, a connection was necessary to allow oxygen-rich (red) blood to bypass your baby’s lungs and proceed into the body. This normal connection that all babies have is called a ductus arteriosus. At birth, your baby’s lungs must now provide oxygen to his or her body. As your baby takes the first breath, the blood vessels in the lungs open up, and blood begins to flow through them to pick up oxygen. At this point, the ductus arteriosus is not needed to bypass the lungs. Under normal circumstances, the ductus arteriosus closes within the first few days after birth and blood no longer passes through it. A PDA is always present at birth. In some children, the PDA does not close. Although exact reasons why this happens in some patients and not in others are not known, the most common reason for a PDA that does not close is prematurity. Why is PDA a concern? Extra blood flowing into the lungs causes higher pressure in the blood vessels. The larger the volume of blood that goes to the lungs at high pressure, the more the lungs have to cope with this extra blood at high pressure. Premature babies with a PDA may have difficulty breathing because of this extra blood flow to the lungs at high pressure. They may remain on the ventilator for a longer period of time. The support from the ventilator also may be high, due to this extra blood flow to the lungs. Older infants or children with a PDA may breathe faster than normal or tire easily, but many children do not have obvious problems. Untreated PDA may lead to long-term lung damage; however, this is uncommon, because most children are treated for their PDA before the lungs get damaged. The size of the connection between the aorta and the pulmonary artery will affect the type and severity of the symptoms, as does the age at which they first occur. The larger the opening is, the greater the amount of blood that passes through and overloads the lungs. The symptoms of a PDA may resemble other medical conditions or heart problems and should be discussed with the child’s doctor. The child’s doctor may hear a heart murmur during a physical examination, and refer the child to a pediatric cardiologist for a diagnosis. A heart murmur is a noise caused by the turbulence of blood flowing through the PDA. Chest X-ray. A diagnostic test that uses invisible X-ray beams to produce images of internal tissues, bones and organs onto film. With a PDA, the heart may be enlarged due to larger amounts of blood flow recirculating through the lungs back to the heart. Also, there may be changes that take place in the lungs due to extra blood flow that can be seen on an X-ray. Learn more about X-ray. Echocardiogram (echo). A non-invasive procedure that evaluates the structure and function of the heart by using sound waves recorded on an electronic sensor that produce a moving picture of the heart and heart valves. An echo can show the pattern of blood flow through the PDA, and determine how large the opening is, as well as how much blood is passing through it. An echo is the most common way that a PDA is diagnosed. Learn more about echocardiogram. What is the treatment for PDA? Medical management. In premature infants, an intravenous (IV) medication called indomethacin may help close a patent ductus arteriosus. Indomethacin is related to aspirin and ibuprofen and works by stimulating the muscles inside the PDA to constrict, thereby closing the connection. Diuretics may also be prescribed to help the kidneys remove extra fluid from the body. This may be necessary because the body’s water balance can be affected when the heart is not working as efficiently as it should. – High-calorie formula or breast milk. Special nutritional supplements may be added to pumped breast milk or formula that increase the number of calories in each ounce, thereby allowing the baby to drink less and still take in enough calories to grow properly. – Supplemental tube feedings. Feedings given through a small, flexible tube that passes through the nose, down the esophagus, and into the stomach, can either supplement or take the place of breast or bottle-feedings. Infants who can drink part of their feeding but not all may be fed the remainder through the feeding tube. Infants who are too tired to breast or bottle-feed may receive their breast milk or formula through the feeding tube alone. PDA repair or closure. The majority of children and some infants with PDA are candidates for repair in the cardiac catheterization lab. The goal is to repair the PDA before the lungs become diseased from too much blood flow and pressure and to restore an efficient pattern of blood flow. Surgical repair may also be recommended if more conservative treatments have not been successful. Repair is usually recommended for infants younger than 6 months of age who have large defects that are causing symptoms, such as poor weight gain and rapid breathing. For infants who do not exhibit symptoms, the repair may often be delayed until after 6 to 12 months of age. The child’s cardiologist will recommend when the repair should be performed. Transcatheter closure of the PDA is frequently performed first if possible because it is minimally invasive. Premature infants, because of their small size, are not candidates for this procedure, and require surgical closure of the PDA. If your child’s PDA is closed by a transcatheter method, they may be able to go home the same day, or may possibly stay in the hospital overnight. Your child’s cardiologist will let you know what to expect. Learn more about transcatheter PDA closure. Your child’s PDA may be repaired surgically in the operating room. The surgical repair, also called PDA ligation, is performed under general anesthesia. The procedure involves closing the open PDA with stitches or clips in order to prevent the surplus blood from entering your child’s lungs. Infants and children who undergo surgical PDA ligation will be cared for in the CVICU after surgery. Your child will be kept as comfortable as possible with medications which relieve pain or anxiety. The staff will also ask for your input about how best to soothe and comfort your child. You will also learn how to care for your child at home before your child is discharged. The staff will give you instructions regarding medications, activity limitations and follow-up appointments before your child is discharged. Most children will only need to stay in the hospital for a few days after the operation. Learn more about heart surgery. What is the long-term outlook after PDA surgical repair? Any other illnesses present in the baby. In children born full-term, the vast majority that had a patent ductus arteriosus diagnosed and repaired early will live healthy lives after recovering from the hospitalization. Activity levels, appetite and growth should return to normal. The child’s cardiologist may recommend antibiotics be given to prevent bacterial endocarditis for a specific time period after discharge from the hospital if a coil or occluder device was used. In children whose PDA was diagnosed very late and/or never repaired, the outlook is uncertain. There is a risk for pulmonary hypertension (increased blood pressure in the blood vessels of the lungs). Parents should speak with their child’s doctor regarding the specific outlook for your child. Most infants and older children feel comfortable when they go home. Pain medications, such as acetaminophen, may be recommended to keep the child comfortable. The child’s doctor will discuss pain control before the child is discharged from the hospital. The nurses in the hospital will give you directions about bathing and activity following PDA repair. Often, infants who fed poorly prior to surgery may have more energy after the recuperation period, and begin to eat better and gain weight faster. Ask your child’s physician if you need to continue any supplements to breast milk or formula or if there is a need to watch the volume of fluids your infant should be fed. The surgical dressing is usually a small gauze covering the site. By the time you take your child home, there may only be thin adhesive strips over the incision. You will be asked to watch for any drainage and redness around the incision site. Bathing is generally limited to sponge baths although showering may be allowed in older children. Do not soak off the strips over the incision. These will loosen in about a week and fall off on their own. If your child will be out in the sun be sure to cover the surgery site until it no longer looks pink. During a PDA surgery, the muscles of the chest wall are cut and the ribs may be spread, and the chest will be tender for a while. It is important when lifting infants and younger children to lift them by supporting their bottom and head rather than lifting by grasping their chest or arms. Most toddlers and young children will self-limit their activity when they get tired. Older children may be given exercise limits for 4 to 6 weeks after surgery, especially activities where a fall may occur that creates a blow to the chest such as riding a bicycle, roller skating, skate boarding, swimming or contact sports. Check with your child’s physician about giving any immunizations for the first two months after surgery. After surgery, older children usually return to normal activity within a few weeks.